A commemorative plaque the Queen unveiled at a gala event in London this year had to be fixed when staff later spotted an embarrassing spelling error. Fixing just three letters in the bronze plaque costs taxpayers about $4,000, or about a quarter of the cost of the original order. 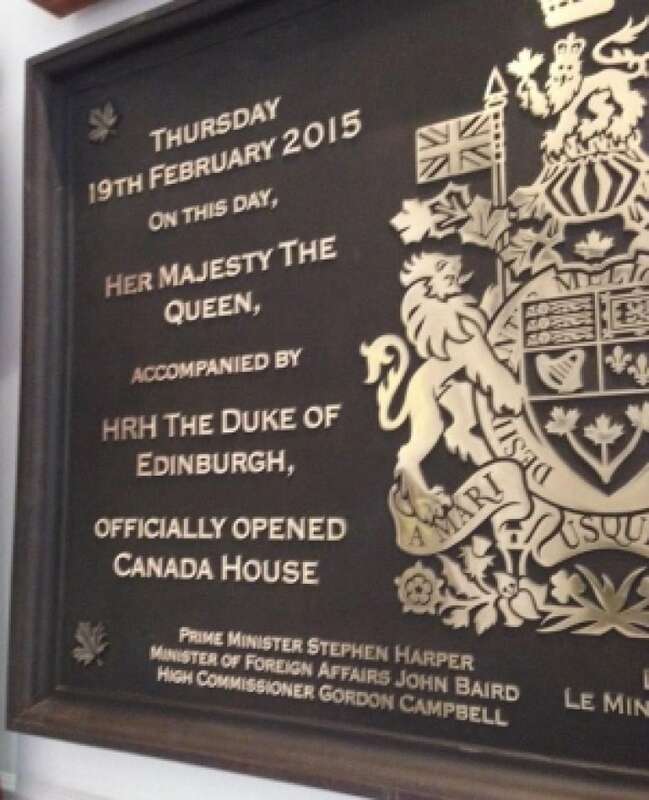 Sloppy proofreading of a bilingual plaque unveiled by the Queen at Canada's main diplomatic mission in London cost Canadian taxpayers about $4,000 to repair just three letters. The plaque was the centrepiece of a gala reopening of Canada's high commission, known as Canada House, in Trafalgar Square on Feb. 19. But the large bronze plaque contained an embarrassing spelling mistake that diplomatic staff failed to notice until after the splashy event. The French-language part of the plaque referred to "Premier Minister Stephen Harper," rather than the correct "Premier ministre Stephen Harper" – an error the staff did not spot when checking the proofs of the original order. This bronze plaque, ordered for $16,000, had some spelling errors in the French-language lettering (not shown) that diplomatic staff noticed only after it was shown at a gala event this year. (CBC)That meant three letter changes were required for a fix: a lower-case "m," and reversal of the "e" and "r." In French, the title "Premier ministre," when written before the name of a sitting prime minister, normally takes a capital "P" and a small "m."
The plaque was dismounted and returned to the British firm where it was first manufactured. Workers ground down the three bad letters, cast three new letters, then pinned and glued them to the metal base. The fixed plate was grit-blasted, re-patinated and re-laquered to look new again, a process that took more than a month. The plaque was installed again inside the building in early September. The final repair bill was about $4,000 ­– or about a quarter of the $16,000 the Canadian government paid for the original work. Details of the errors and repairs were obtained by CBC News under the Access to Information Act. The sloppy proofreading appears to be the result of Canada's last-minute rush order to the foundry in January this year. "Why something of this complexity was not ordered months ago is a mystery to me," Johnnie Jourdan, director of Britannia Architectural Metalwork Ltd., wrote to Canada's diplomatic staff in February, even before the spelling mistake was identified. Jourdan called it "an almost impossible deadline." 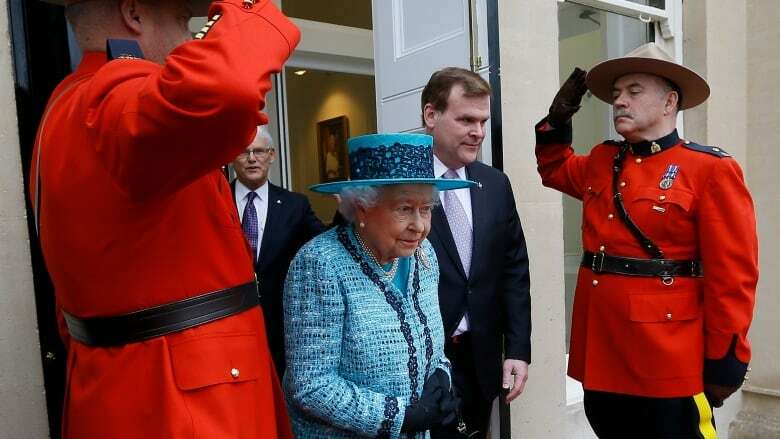 The Feb. 19 event was to celebrate the refurbishment of Canada House, with guests of honour the Queen and Prince Philip. The posh gathering cost taxpayers about $209,000 for a few hours that featured fine wine, a breakfast buffet and four Mounties in red tunics standing guard. The Queen, who is bilingual, pulled the cord on a lush red curtain to unveil the bronze plaque with its French spelling error, though no one appeared to spot the problem at the time. "It was noticed by a staff member soon after its unveiling … but the high commission had to find a time when it would be least disruptive to business at the mission to have it removed and to coincide with the foundry being able to carry out the work," Diana Khaddaj, a spokeswoman for the Foreign Affairs Department, said in an email. The bronze plaque has a history of bad karma. 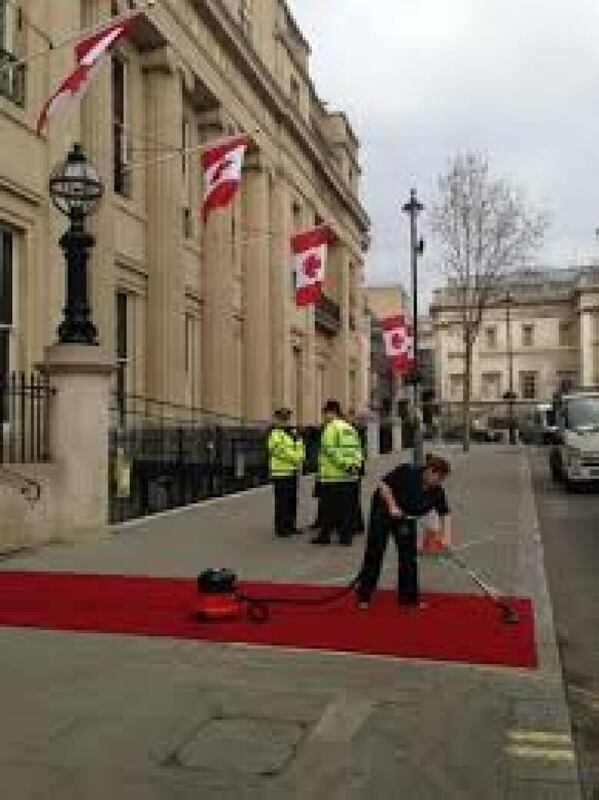 Preparations for the Canada House reopening in February this year. The entire gala cost more than $200,000. (CBC)And the bronze plate as first delivered had a flaw. "The plaque arrived slightly warped, which didn't affect its appearance but made it slightly more difficult to hang," said Khaddaj. "There was no need to repair it. The foundry provided us with a small rebate on the final price." Canada House was first opened in 1925, and was recently given a massive refit and restoration, paid for in part from the $562.5-million sale of another diplomatic property in London, Macdonald House, in 2014.